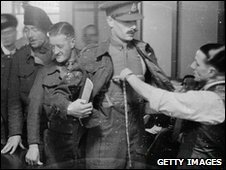 As the British Army plans to get rid of up to 500 soldiers, the papers are awash with efforts to get jobs for ex-servicemen. But how hard is it for former soldiers to find jobs? Every year in the UK about 24,000 people leave the Armed Forces for "Civvy Street". And it's apparent that some ex-servicemen find the transition hard. It is feared as many as 1,100 of them end up sleeping rough on the streets of London every night. And according to MoD figures, 3% of prisoners - nearly 2,500 - are ex-military. But now the plight of ex-servicemen is back in the spotlight, with the Sun's Jobs For Heroes campaign and the Metro free newspaper's publicising of Hire A Hero. So do ex-soldiers really struggle to find employment? The Ministry of Defence says 96% of those coming out of the military find employment within six months - and all leavers receive resettlement advice and careers advice for up to two years. But it has no figures on how many are unemployed after that first six months. Recruitment agencies are trying to fill the gap. A cursory Google throws up names like Forces Recruitment Services, Ex-Mil Recruitment, Force 10 Recruitment, and Heyman Woodworth Recruitment. ForceSelect, the latest specialist agency - a for-profit business with an associated charitable foundation - launched to support military service leavers, puts the figure of unemployed ex-forces personnel in Britain at 50,000. "The MoD figures are tosh - they reflect anyone who has applied for a tax code - it could be for one day's work in a bar, a week of potato picking," says its founder Hugh Andree. "It is a fact that there is no actual data that analyses how many are employed and more importantly, in what sort of jobs." But Defence Secretary Bob Ainsworth has welcomed the launch of the new agency, urging "Britain's employers to offer our Veterans a job". "The men and women of our Armed Forces are the best of British - they have the qualifications, skills and can-do attitude to succeed in any job," Mr Ainsworth told the BBC. "They would be an asset to any firm. Veterans looking to start their own business can also access new government-funded business loans and grants, being offered through the Royal British Legion. " But some leavers think the MoD should be doing more. James Mepham, 23, from Hertfordshire, served in the Royal Signals for four years. He has now found a job working in security for Unite, but says on leaving in February, he was only entitled to a "basic allowance" of career transition advice. "The MoD was not that helpful. I ended up spending about £500 on security courses - I didn't realise I was entitled to three courses costing up to £1,000 over 10 years." It is a view echoed by former Warrant Officer Ian Adshead, 42, from Oxfordshire, who left the Army in 2008 after 22 years service and five tours of duty. He says the MoD's role and resettlement advice was a "total let-down" and the process of looking for a new job - despite starting 12 months before he left the Army - was "completely demoralising". "Resettlement was lip service, you are told about training, given a bit of money, shown a website, that's it - they don't tell you what types of jobs you are qualified for, what level to pitch yourself at, and there is no time to have an effective transition or retrain for a career structure. "Job centres are also completely unprepared for ex-military personnel. It was as if I'd just left school - I didn't know what to do with myself, I had no-one to help or guide me. I took a position for 18 months, but it was not right." Earlier this month, the MoD said it was introducing "Armed Forces champions" in more than 50 Job Centres across the UK. A new venture to help wounded, injured and sick soldiers leaving the Army find work was also launched in February, the MoD says. But Mr Adshead says there is also ignorance among employers. "If you are in charge of a team in Afghanistan, work for 37 hours in 50 degrees heat, exercise managerial skills, motivate people, plan operations, surely that equips you to work in a business?" So are employers guilty of dismissing the skills of ex-servicemen? The Career Transition Partnership (CTP) - a partnership between the MoD and global career development specialist Right Management - denies there is any reluctance among employers about hiring service leavers. While many leavers enter industries that match the 150 trades within the Armed Forces, the top sector recruiters are engineering, civil service, transport and logistics, security and public services. But Dr Jim McDermott, from the Centre for Labour Market Studies at the University of Leicester, says there is a problem in that very few employers nowadays have any idea what it means to be a warrant officer, gunner or sapper. "In the 60s or 70s employers knew about the Armed Forces because everyone had a relative or friend who had served in WWII - plus there [had been] National Service. Before Northern Ireland, it was also a lot more common to see soldiers in uniform, since then military society has gone behind the barrack gates." Ex-servicemen or women need to start planning their new career four or five years before they leave the forces, he says. But he argues it is a myth that officers get an easier ride than squaddies when it comes to finding a new job. Another thing all ex-servicemen struggle with is the "divorce from military society" because they are used to a sense of camaraderie, he says. Soldiers who sign up at 18 and leave after 22 years often find the transition the hardest because 40 is a strange time of life to start a new career and resettle a family, he says. But the Royal British Legion, which gives grants to service leavers for training, says an increasing number of young ex-servicemen are coming to them for help. It is a pattern the founder of ForceSelect, Mr Andree, agrees with. He says those who leave within the first four years - who are typically 20 or 21 years old - face the biggest challenge. But the ex-infantry officer says the problem is much more widespread than that, with all ex-servicemen, of all ages, typically taking a job after three to four months "out of necessity", with the position rarely meeting their potential. "The public might have a view of forces personnel shouting out orders, but in essence they are very task-orientated people; hard working, disciplined, enthusiastic. Ex-servicemen might lend themselves to skills like security, recruitment or sales, but they can just as easily be responsible for making sure products are in a clean, tidy supermarket on time. "The opportunities are diverse. 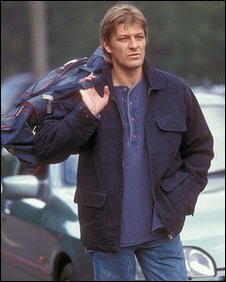 At the moment we've got 20 men in Norway filming a Sean Bean movie, and a British-based security company is talking about wounded soldiers working in a security control room for 2012, as they have valuable experience in signals, CCTV systems and logbooks." The agency is working with SAS veteran and author Andy NcNab, who says employing highly skilled and motivated service leavers would create a boost to the UK economy. "No matter where you are in the services, everyone has the same work ethic, the same core values, it's tribal. As we say in the military, we just want to crack on."